It’s a pity that scuba diving is not simply a matter of swimming around underwater while breathing from an independent air supply. In the early days of the aqualung, some adventurous people tried doing this without any basic understanding of the effects of breathing compressed gas while under the very intense pressure caused by water at depth, resulting in some horrible accidents. To dive safely, you will need some understanding of the effects of pressure. The atmosphere has a weight. Only the gravitational pull of the Earth stops it from floating away into outer space. There is about 100 km (60 miles) of atmosphere above us, and it is pressed down on us with the pressure of 1 atmosphere (1 bar). We are used to it and don’t really notice it, but we would surely notice if it wasn’t there. Water is much denser than air. The pressure exerted by only 10 m (33 feet) depth of water equals about the same as 1 atmosphere and, of course, it has the atmosphere pressing down upon it, too. So by going to 10 m (33 feet) deep in water, we effectively double the absolute pressure acting upon us. So why aren’t we squashed? Well, that’s because liquids cannot be compressed, and we are mainly made up of liquid. But we do have some air spaces within us. Air spaces naturally found in the body include the lungs, the spaces connecting the lungs to the nose and mouth, the sinuses and the middle part of the ear. Gas (air is a mixture of gases) can be compressed. The volume of a gas is inversely proportional to the pressure to which it is subjected. A full, open-ended vessel or a flexible container containing, say, 4.5 L (one gallon) of air at the water’s surface will contain only 2.25 L (half a gallon) of air at 10 m (33 feet) below water, where the pressure is doubled. The mass of air remains the same. When we breathe compressed air under water, we breathe it at the same pressure as the water surrounding us. As we continue to breathe and change our depth, the equipment supplying the air automatically alters this pressure to match. However, if we took a breath of compressed air at 10 m (33 feet) deep and held it in our lungs as we ascended to the surface, it would double its volume, doing irreparable, often fatal damage. 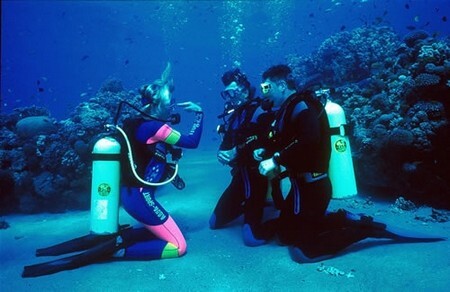 So the first rule of scuba diving is to breathe normally at all times and to never hold one’s breath. There is also an air space in your ears. You’ve probably noticed pressure or even pain in your ears when you have swum down a short way under the water. The air gets compressed, and the water distorts your flexible eardrums as it presses on them. The pain results from the imbalance between the water pressure and the air pressure within your ears. You can break these flexible membranes very easily with quite unpleasant side effects. During the first part of your training, you will be taught how to equalise this pressure, and it will become something you do without even thinking about it.